Could It Be Illegal To Drive An Ex-Cop Car? We think that decommissioned police cruisers make great used cars, but could driving one be illegal? One Jalopnik reader found out from a run-in with the police. In 2010, Canadian reader and retired city police officer Wolfgang bought a 2003 Crown Victoria that had been used by the Royal Canadian Mounted Police. It had 162,000km on the odometer, but for $4,000CDN, it sounds to us like he got a good deal. 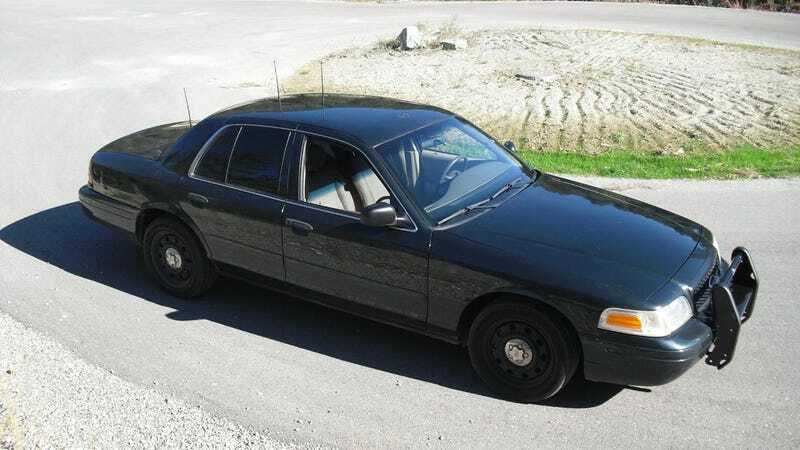 Old Crown Vics make for great highway cruisers and they're pretty tough, workable cars. Wolfgang re-painted the car from dark green to black, put it on 18 inch black steelies for summer tires, tinted the rear windows within legal limits, and installed a bull bar. His Crown Vic had started to look a lot like an undercover cop car, but did that count as impersonating a police officer? Is it illegal to be in a car that looks just like a police vehicle? He had a run-in with the police that helped explain where the law stands. Had a very nasty run-in with one local RCMP officer who threatened to charge me under the Criminal Code for "Impersonating a Police Officer". Luckily, after 43 years in law enforcement myself, I knew our criminal code a little better than he did. off at the guy "who drives a nice car than me." Wolfgang went into greater detail. The Criminal Code of Canada does not say "Impersonating a Police Officer." It reads "Personating a Public Officer." And in order to commit the offence of ‘personating' you have to actually do something, not just driving a car that looks like a police car. I checked case law for Canada and found 2 cases. In one, 2 guys in a police-look-alike Chevy Malibu had pulled over a guy and accused him of a traffic offence. Took him to the next ATM and relieved him of a few hundred dollars. The other case was a Californian driver with a white Crown Vic Police Interceptor with red and blue lights still installed and functioning. He was caught on the Trans Canada Highway here in BC doing in the neighbourhood of 200 km/h, using his blue/red lights and passing other cars like his tail was on fire. In both cases: Doing something illegal. My case got even funnier. Long story. I asked him 3 times what I had done wrong. "I thought I saw tinted windows." "I believe your car does not conform to BC standards." I asked him if he actually knew anything as that would be his job as a police officer. Then he accused me of the Criminal Code offence. Told him to write me a ticket if I had done anything wrong, if not get out of my face and get a life. That was kind of the moment when he spun out on me. "If that's what you want !" He wrote me an inspection order without checking anything off, because there was not a thing wrong with the car. I did the inspection to the tune of $106CDN for absolutely no reason other than a pissed off cop. The twist to the story is that Wolfgang used to be a police officer, and he has connections. This turned out to be quite useful. Then I went home and called his boss, the Traffic Sergeant in Cranbrook. Turns out, that guy and I know each other quite well from many years ago when he worked in Saskatoon and visited us quite often in our detention cells on those quiet and –40 C nights, when nobody was moving other than cops and cabs. And drunks, of course, to keep both of them fully employed. I told him my story and that I wanted two things out of that: number one, nothing on my driving record, number two, I want my money back. He called me back a few days later and requested that the next time I or my wife are in Cranbrook for shopping ( a 130 km one-way-trip) to see him in his office. Now I was thinking, what will the check say where the money comes from. Not the RCMP. They don't have a slush fund for bully cops. Not the Sergeant, that's for sure. So, my wife came back with $ 106 in cash — I know where that money came from! While I'm no lawyer, the lesson from this story seems to be, no, you can't get arrested for just driving around in a car that looks like it's an undercover police vehicle. If you do, however, decide to get a black ex-cop car and give it a bulbar and other mods so it really, really does look like a police vehicle, you may end up getting hassled. So we still recommend that all of you who are looking for a comfortable, reliably used car look into decommissioned police cruisers. Just maybe paint them something other than black. Photo credits and hat tip to Wolfgang!